The tank has a very weak hull so it's not recommended for leading a push. Try to only show your turret if possible. 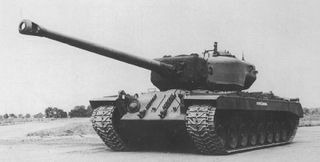 T34 works very well when you can get behind cover and support your teammates, having a gun that can penetrate tier 10's with well placed shots and having turret armor that can bounce most enemies you are up against, proving to be a tank that cannot be ignored even by the biggest and baddest.